Last week, the University of Missouri announced a new method to detect silver nanoparticles in fresh produce and other food products. Though not mentioned by researchers, it’s conceivable that the protocol could be modified to test for chemtrail dispersants, as well, since the particles dispersed are in the nano size range, measured in billionths of a meter. Over 200 agricultural pesticides contain nanosilver, which studies have shown to be toxic to humans, under certain conditions. Over 1,600 consumer products are known to contain nanoparticles, ranging from clothes to cleaning agents, to food, cosmetics, and drugs; but with no regulatory requirement to disclose, the real number is likely far higher by orders of magnitude. “Our goal is to detect, identify and quantify these nanoparticles in food and food products and study their toxicity as soon as possible,” said Mengshi Lin, associate professor of food science in the MU College of Agriculture, Food and Natural Resources, and lead author of the study published in the Journal of Agricultural and Food Chemistry. Lin’s team immersed pears in a silver nanoparticle solution similar to a pesticide application. They washed and rinsed the pears repeatedly over four days and found silver nanoparticles still attached to the skin, and some that had even penetrated the pulp. “The penetration of silver nanoparticles is dangerous to consumers because they have the ability to relocate in the human body after digestion,” Lin said. Several years of toxicity studies on nanoparticles reveal a host of health issues associated with their ingestion, including DNA, brain and respiratory damage. Later, Ho reported that a 2012 study shows nanoparticles bioaccumulate in soybeans, the nation’s second largest crop. Several lawsuits against the Food & Drug Administration and Environmental Protection Agency seek regulatory oversight, to no avail. In 2010, the FDA absurdly denied any foods contained nanoparticles, this despite its own scientists admitting it. In 2012, when the FDA was finally forced to admit nanoparticles exist in our food and cosmetics, it refused to regulate them. Nanoparticles are ubiquitous in the drug industry as well. Not only can skin be fabricated on a nanoplatform, but a new development promises their nano product can encapsulate and destroy viruses. 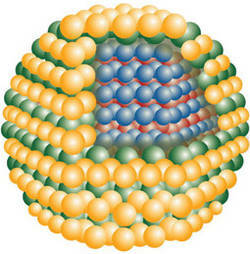 What happens to those nanocells after the virus is destroyed? Where do they go? We do know that nanoparticles can reach every part of the body and accumulate and damage an organ’s function, because of their ultra high reactivity due to their tiny size. As with quantum physics, particles in the nano-size range behave differently than at the macro level. Farmers and gardeners understand this instinctively when working with clay versus sandy soils. Clay particles are so tiny (2,000 nm) compared to sand (50,000 nm) that clay’s electrons can exert more attractive force, binding the tiny particles together. Too much clay in a soil’s texture, and water will be trapped, unable to seep further into the soil, drowning a plant’s roots. Too much sand in the soil, and the water drains down before plants meet their water needs. By way of comparison, a red blood cell is 7,000 nm, while the DNA molecule is only 2.5 nm wide. Nanotechnology allows us to take apart and reconstruct nature at the atomic and molecular level, wrote the International Center for Technology Assessment in response to the FDA’s refusal to regulate it. “[Nanotech] is best understood to mean materials that have the capacity to be fundamentally different, with new chemical, physical, and biological properties that cannot be predicted from the properties of their larger material counterparts. So the University of Missouri team has made an important breakthrough. It’s possible that a protocol similar to the nanosilver test could also be developed to detect other types of nanoparticles, including barium, strontium, aluminum and fluoride, elements found in higher-than-normal quantities after an aerial spray. In an interview with George Noory, activist and filmmaker Dane Wiggington reports that the aluminum sprayed in chemtrails is only 10 nm in size. A particle that small can go anywhere it wants. As these metallic nanoparticles accumulate in our bodies, we are becoming “more conductive” and thus more receptive to radio frequencies. This is just one more reason why smart meters are so dangerous. Proving chemtrail damage to humans and the environment may be the tool needed to waken the sleeping giant. Lord knows no empire was ever “voted” out of power; it has always taken the masses to storm the Bastille, so to speak. With all the forced modifications to our DNA, one can easily imagine becoming a nanoslave for Empire. Wouldn’t it be just our luck, then, to run into Dorothy Brodesser when she’s pointing a double-barreled shotgun at Bruce Willis in Surrogates. “You’re an abomination,” she explained, right before she blew his robotic self to pieces. An earlier version of this article appeared at Activist Post. This entry was posted in Environment, FDA, USDA, Food & Farming, Weather Modification and tagged EPA, fda, mengshi lin, nanofoods, nanopollution, nanosilver, quantum dot, univ of missouri. Bookmark the permalink. No which will be that which gets squashed……………………?? How are silver nanoparticles toxic when colloidal / ionic silver is not? of all the nanocrud around, silver would be the least one Id worry over, our silversolutions already are nanoscaled. the biggest worry over nanosilvers use I can see is the abuse/overuse allowing bacteria and viruses to manage to mutate same as they have with antibiotic abuse. even the stupids at epa fda admitted the volumes in waterways is rising and of concern. and maybe?? industry should back off on it. meanwhile Food producers and the film/packaging mobs are happily impregnating their products with it to kill salmonella and ecoli etc in dodgy products. yeah, Oz, and thx for clarifying the point of my article in your comment at AP.